Contraband is the latest Mark Wahlberg's movie. And not for the first time Wahlberg is the main hero in an action film even if he scarcely takes part in the action himself. It seems that Contraband is kind of a remake of a four-year-old movie called Reykjavik-Rotterdam. The more curious fact though is the Icelandic director of Contraband, Baltasar Kormákur, plays the lead (the role of Mark Wahlberg) in the former film. Since Contraband is set in America, I suppose Wahlberg has been the better option for the role. Thus, Kormákur has the "easier" assignment just to direct the remake. 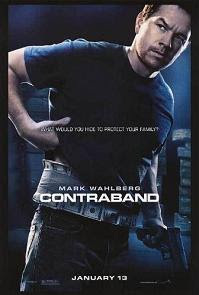 Contraband is about a former smuggler with a legendary status named Chris Farraday (Mark Wahlberg) who has left his smuggling days behind. He lives happily in New Orleans with his wife Kate (Kate Beckinsale) and their two children but unfortunately, Kate's brother Andy seems to have not been listening to Chris advices to stay away from criminal affairs. After a drug transfer executed by Andy fails, Chris is forced to return to his smuggling days in order to settle Andy's debt with Tim Briggs (Giovanni Ribisi), a young criminal boss for whom Andy has been working. Chris heads to Panama to import a pile of counterfeit bills but as expected everything goes wrong so he and his newly assembled team have to adapt their behaviour almost in real-time. Meanwhile, Chris' wife and children have the task to survive in the United States until he's back. Mark Wahlberg is the typical cool male protagonist in Contraband. He does not demonstrate a bunch of new acting skills and as far as I recall correctly, he does not make even a single shot in the movie but still he fits well in the role of a charming leader and respected smuggler. Giovanni Ribisi is not very convincing as a mob boss (which could be attributed to the role itself) so his rough resemblance to Metallica's drummer Lars Ulrich would be pretty much everything I will remember him with. Kate Beckinsale hasn't been in a movie for several years and it seems this year she will be back with more than a couple of screen appearances. She does not have a huge role here and it's hard to determine if she's in a good shape by just seeing her in Contraband but her character looks pretty and worried which, I suppose, is what mainly has been anticipated from her. To continue in this direction, Contraband delivers pretty much everything you would expect from a movie like this. There is a portion of action, a couple of small twists, some thrilling moments, a pinch of drama as well as a few funnier scenes and of course, a happy ending. But on the other hand, this same predictability is what depreciates the film considerably. You can see coming all of the major events and the only non-evident elements in Contraband lies in the details. Another thing I find to be problematic is the filmmaker's decision to include Chris' brother-in-law in the team for the job in Panama having in mind he's not a very dependable guy but apparently this has been important for the plot. So, a recommendation for this movie is easily determinable and even does not need my meddling: since Contraband possesses exactly what one would anticipate to find in it and there is hardly anything to surprise you in whatever aspect, you should be able to decide whether to see the movie or not without further help. There’s not a lot to think about while watching it and we’ve seen some of this plot before in other films, but for a movie opening in January, it’s actually pretty damn good thanks to a couple of cool heists and a relatively good cast. Nice review. Check out mine when you get the chance. Thanks for the comment. It would be bad if Contraband was worse than expect which it is not. :) I checked your review and it was nice to be read. Keep up the good work!